Ahhh pumpkin beers…..Everyone’s favorite style…..well, maybe not. But, I can’t lie, I do enjoy a pumpkin brew everyone once in awhile, especially on a crisp Iowa fall day. I can understand the people who don’t like them either, I’ve found myself scoffing at a few pumpkin offerings trying to figure out what exactly the brewer was trying to do to make their pumpkin beer stand out from the others and I mostly realize that they aren’t. 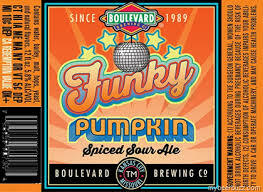 That’s what I liked about Boulevard’s Funky Pumpkin, it’s relatively unique twist on a pumpkin beer. Maybe having this beer during the Iowa game last Saturday made it taste better but the cinnamon, nutmeg, and ginger spices meshed well with a slight pumpkin flavor, the tartness, and the Brett to give it a little funk. Identified as a spiced sour, this could be the perfect mix for Brett-heads and pumpkin fans alike! Funky Pumpkin is our unique spin on a pumpkin beer. Spiced with nutmeg, cinnamon, allspice and ginger, the final beer is a blend of brewhouse soured beer and beer aged in a stainless steel tank with brettanomyces. Tart and slightly earthy, Funky Pumpkin features a subtle toffee/caramel malt character that allows pumpkin pie spices to shine. Boulevard’s ever-expanding portfolio continues to impress me and to me, this is a standout pumpkin beer that’s on Eastern Iowa shelves right along with Schlafly. Singles are available if you’re scared to commit to a sixer…give at least one bottle a try! AROMA: pumpkin, cinnamon, nutmeg, and just a bit of that sourness. TASTE: start with the sour upfront and then you get cinnamon and a bit of sweetness to counteract the sour. My recommendation: One of the more unique pumpkin beers you will find and this one happens to be very drinkable. We don’t have Warlock, Pumpking, Punkin, and even if we did I’d still find myself sipping on one of these every fall. Stone Enjoy By 11.21.15 BLACK IPA coming to Iowa?